More common types of chapels in Boston are the chapels in healthcare organizations that exist across the city. 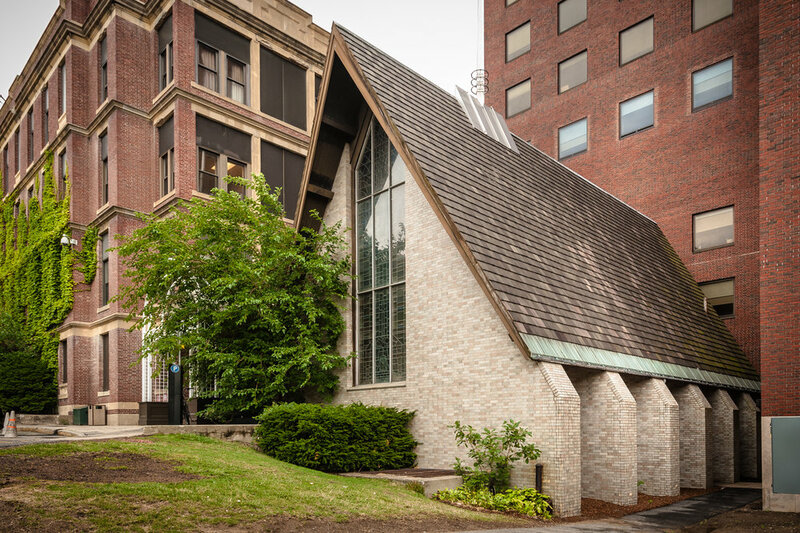 The chapels at Beth Israel Deaconess are particularly interesting because the hospital was created in 1996 through the merger of Beth Israel Hospital which was Jewish and New England Deaconess Hospital which was Methodist. Each had its own chapel. The Wolfson Chapel on the East campus, originally Beth Israel Hospital, was a Jewish focused chapel from the early years of the hospital. It was renovated into an inter-faith space several years ago to intentionally support families from a range of religious and spiritual backgrounds. Original stained glass panels by Emanuel Genovese remain, as do plaques naming early supporters of the chapel. A tabernacle holding communion wafers was added in a cabinet next to prayer rugs for Muslims as was a sign pointing towards Mecca. Many hospital visitors, staff and patients stop into the centrally-located Wolfson Chapel for a short visit. Visitors leave notes and prayers in a black book on the table in the chapel. Rather than removing all religious symbols when the space was renovated, the hospital’s Advisory Committee on Religious Diversity opted to add new ones to recognize the religious diversity of staff as well as patients and families. “We made the decision to ‘lift up’ and celebrate our religious diversity, rather than aim for a purely neutral space,” explained Rev. Katie Rimer, Director of Spiritual Care and Education. A meditation gathering takes place in the Wolfson Chapel on Wednesdays, attended by staff. Adjacent to the chapel today is the office of the Director of Spiritual Care and Education, a space previously used for bris ceremonies in the Jewish tradition in the former Beth Israel Hospital. 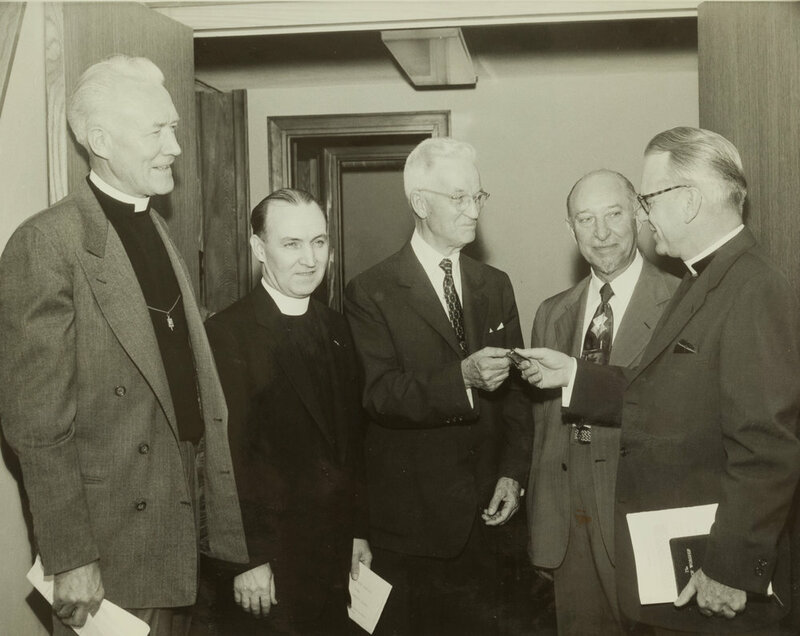 On the West campus, the Arthur Dooley Chapel was built in 1956 when the hospital was New England Deaconess Hospital founded by Methodists. This chapel has all the trappings of a traditional Methodist church including floor to ceiling stained glass windows with biblical verses, an altar, and today an organ. From the outside, this chapel looks like a small Methodist church connected to the hospital. A black and white photo of the chapel in earlier years hangs in one corner; it shows the sanctuary filled with traditionally dressed nurses and nursing students. During minor renovations to the space a scrapbook was found documenting the chapel’s construction, dedication and early events. More recently, some of the pews were removed to create floor space where Muslims can pray. Information for Harvard Longwood Muslims is also available here, as are prayer rugs and a sign pointing in the direction of Mecca. Mass takes place in this chapel on Sundays at noon and a meditation gathering, mostly for staff on Wednesdays. Additional services for memorials, or those connected to public events, are scheduled as needed. As in the chapel on the East campus, a black book is filled with prayers. 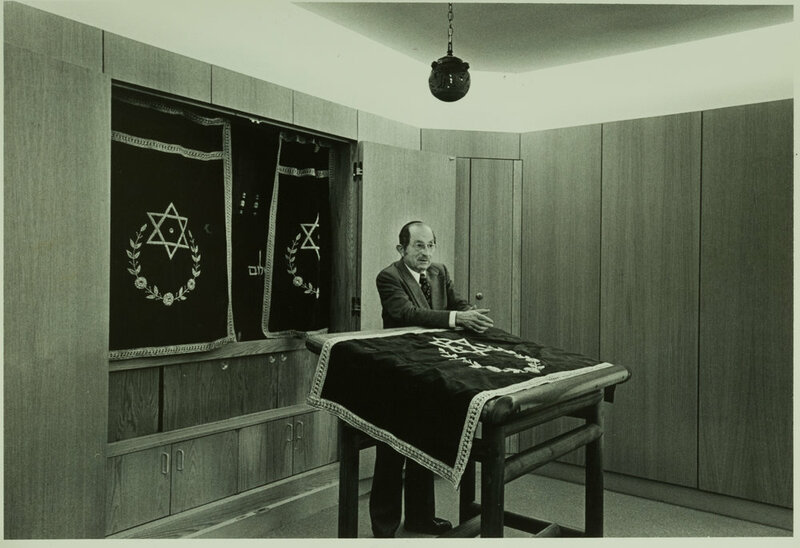 Many thanks to Susan Pasternack, archivist at the Ruth and David Freiman Archives at Beth Israel Deaconess Medical Center, for allowing us to copy and reproduce these images.